These new Kia vehicles are killing me. So beautiful! Last week, the 4 Hats Crew got to test drive the new, fully loaded, 2013 Kia Optima Hybrid. 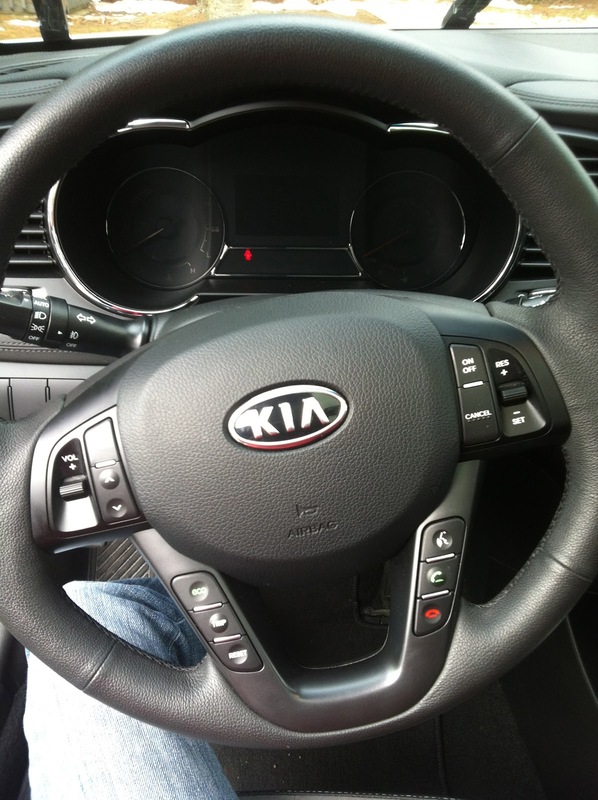 I was very excited to do a Kia Optima Hybrid Review. We’ve never driven, yet been in, a hybrid vehicle, and I’ve heard so many weird stories about them. Weird, in my mind, equals cool, funky and interesting, so I was hoping for a vehicle that was weird to the max. And boy was it. The first characteristic that surprised me was the room. There was a good amount of legroom in that sedan! In my mind, I still view Kia vehicles as the new car line from when I was in high school, that was little on space but great on price. Boy have they changed. I was impressed with not only the leg room in the front, but the room in the back. The kids had plenty of room to stretch out their legs and car dance with a passion. The drive on the kia optima hybrid was incredible. It was very smooth, and due to the use of the battery and the engine simultaneously, it was incredibly fast. If you didn’t pay attention while driving on the highway, you could easily end up at 75 miles per hour without knowing it. As Michael Jackson would say, she’s a Speed Demon! The car is also VERY quiet. I mean, so quiet that you’re going to think the car has totally turned off. Don’t freak out, it’s still on. She’s just purring at you. And conserving energy. She’s a sweetheart that loves the Earth and not making too much noise. She also loves to save on gas. At over half a tank, we still had 282 miles until empty. Speaking of which, The Kia Optima Hybrid is a rockstar on gas! As a frugal gal, this is what impressed me the most. On one tank of gas, you can possibly get about 560 miles of highway driving. Did you read that? Over 500 miles on one tank! The car was delivered to us on a full tank, and after a whole week of driving, and two really long drives to some events that weekend, we returned it at just under 3/4 tank. I think that’s when I fell in love with this car. I immediately saw all the money we would save on just gas. A hybrid really is worth giving a go if you are a big driver. 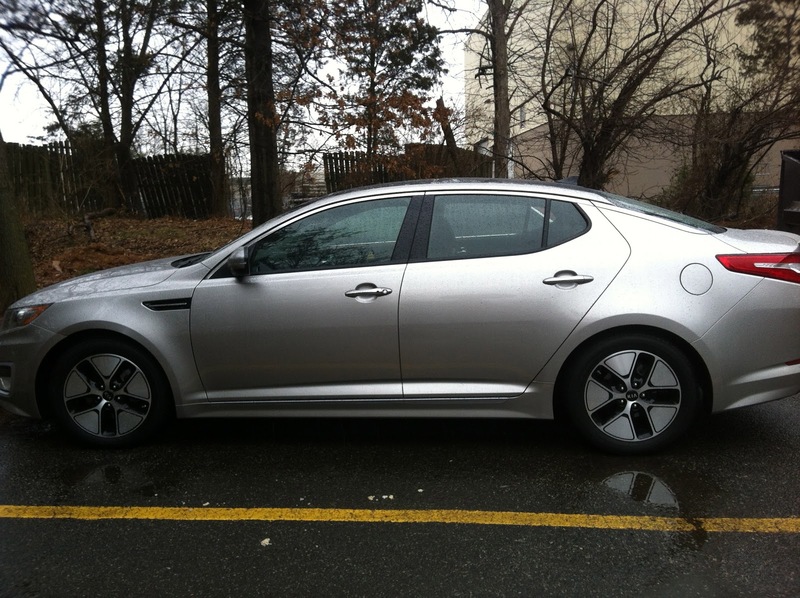 Would the Kia Optima Hybrid work for our family? Well, even though we loved the girl, I think we’d have to upgrade to a Sorrento if we went this route. If only they offered the Kia Sorrento as a hybrid, we’d be all set! We do a lot of road trips to see the in-laws, and with Sonny starting up sports in the fall, we’d need something a little bigger to hold all of his gear. But the best part is that all Kia vehicles are affordable. If someone part of the frugal crew was in the market for a new car, the Kia Optima Hybrid would be the way to go. The 4 Hats Family gives this vehicle two thumbs up.